You all know we are beauty obsessed! We could probably open our own pop-up shop if we wanted to and have tried so many beauty products out there. Since at a young age, our Korean mother has always taught us the importance of a daily skincare beauty regimen that we still live by. We have used the 12+ Korean step routine, but let’s be real… We are mama’s who need a fast and easy daily routine that we can manage. 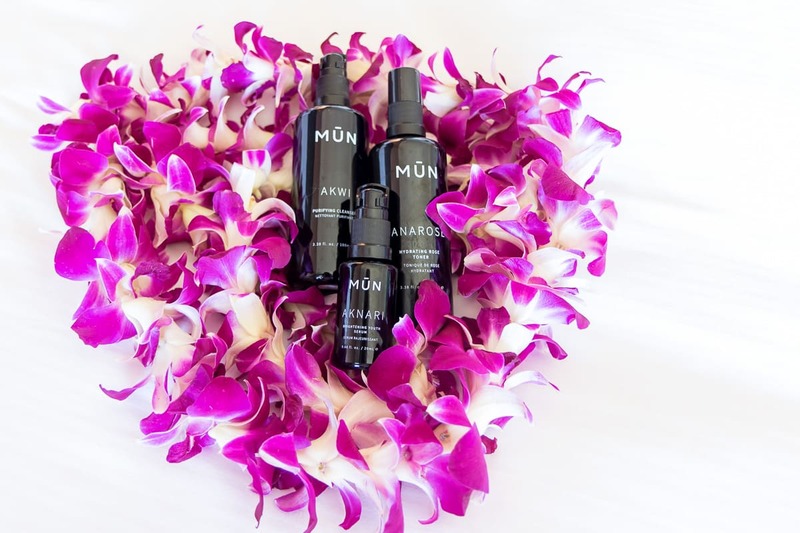 For the last 4 years, MUN has always been a favorite (Aknari brightening serum that we always rave about! ), so when they added a cleanser and toner to their line, we had to try it. (Note: We both have oily/combo and sensitive skin, so don’t be afraid to try this oil-based cleanser) This gentle, pH-balanced formula is a soothing, detoxifying cleanser that even removes waterproof makeup! Yes, waterproof- one less step in your beauty routine. Apply 6-8 pumps in the palm of your hand and massage onto dry skin. Add some warm water to your fingertips and continue massaging as the cleanser emulsifies. Rinse with warm water. If you want a deeper exfoliation, you can use the organic face towel that is suitable even for the most sensitive skin. Our skin felt very cleansed and moisturized. You won’t receive that tight feeling with this cleanser, nor the oily residue. Your skin feels like it’s just been nourished! Nothing feels better to start and end your day with a fresh, cleansed skin. This toner is one of our all-time favorites that calms and balances the skin’s pH after it has been cleansed. The Bulgarian Rosewater instantly calms, soothes and hydrates the skin with a couple of sprays onto the face. As soon as you spray it on, you feel uplifted and refreshed with the light scent that also gives you a glow. This is one of the best toners we have ever tried! With this, you can either spray it on or use a cotton pad for a deep clean of residue. This serum is not only a cult favorite, but it’s also magic in a bottle! We have raved about using this for years and continue to use this daily. It’s a lightweight serum of Prickly Pear Seed Oil, which is extremely rich in linoleic acid and super antioxidant Vitamin E. With the combined efforts with Argan oil, this helps smooth wrinkles, repair sun damage and lighten dark spots. There is always such a misconception of using an oil when you have oily skin like us, but trust us- our skin has never looked so damn good and leaves our skin silky and soft! (Never greasy) If you want your skin to look radiant, brighter and improve your overall skin appearance, look no further. We love that you can even use this for under-eye treatment too as it brightens the under eye and stimulates collagen production. Apply 2-3 pumps and gently dab it over the entire face and neck. 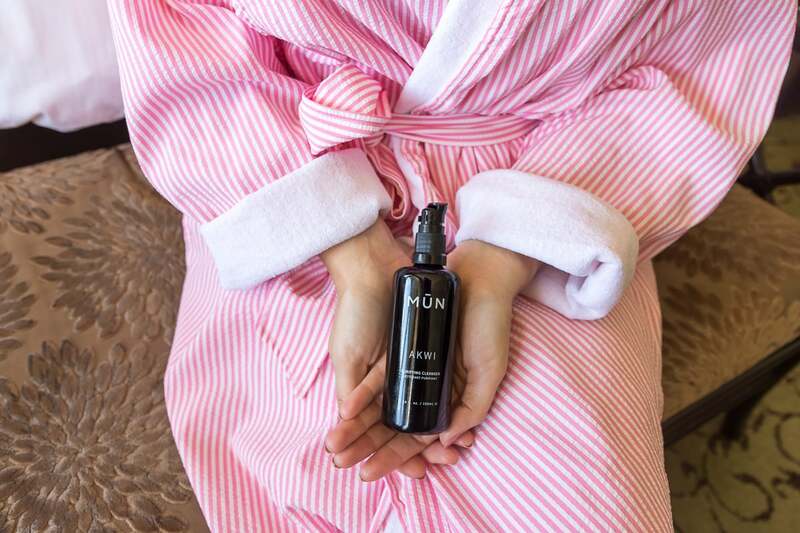 We love that MUN is a natural, minimalistic skin care line that is great for all skin types and all ages. From using the 3-step products: Akwi Purifying Cleanser, Anarose Hydrating Rose Toner and Aknari Brightening Serum, we received glowing and brightening results and truly believe they work together for maximum benefits. For our special readers, we have teamed up with MUN to offer a special 15% off discount code using islandfevermun. Visit www.munskin.com to read more on their products. We hope you can try these amazing products that deliver glowing skin.